Irene Jones, age 94, of Aurora, passed away Friday, March 10, 2017, at the Memorial Hospital. Memorial Services will be held 11:00 A.M. Tuesday, March 14th at the St. John's Lutheran Church in Kronborg. Rev. Ben Erzkus will officiate. Private Family Inurnment will take place at Mamre Cemetery. No Visitation. Higby-McQuiston Mortuary is in charge of arrangements. Condolences may be e-mailed to the family through the mortuary website at www.higbymortuary.com. 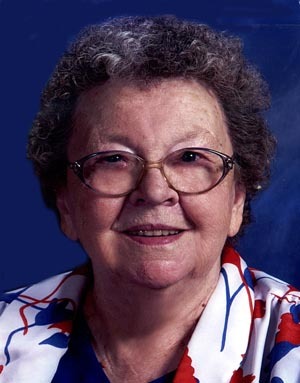 Irene Maxine Jones, the daughter of John Oscar and Edith N. (McCoy) Peterson, was born in Marquette, Nebraska on February 1, 1923 and passed away in Aurora, Nebraska on March 10, 2017, at the age of 94. She was raised in Hamilton County and went to Bell School District #21 through the 8th grade. Irene graduated from Marquette High School in 1940. Irene was united in marriage to Kermit Emil Jones on March 2, 1944 at Norfolk, Virginia. When Kermit returned from the service they moved to the home place, where he was a dairy farmer. She was a resident of Hamilton County until they moved to Central City in 1992. Kermit passed away on February 24, 2003. Irene moved to Aurora following his death. Irene attended Mamre Evangelical Free Church, where she served as Sunday School Treasurer, WMS Treasurer and White Cross Leader. Irene was a member of St. John's Lutheran Church in Kronborg, where she became a member through baptism in 1990. She served as head of the Sew & Sew and WLCA Treasurer. Irene belonged to the Marquette & Kronborg Senior Citizens and Central City Senior Citizens Centers. She liked to sew, crochet and upholstery work. She was preceded in death by her parents; husband; daughter-in-law, Glenda Jones; a brother, Donald (Gladys) Peterson; his twin sister, Doris Eileen and two sisters, Shirley (Orville) Bjorkman and Janelle (Harold) Anderson. Those left to cherish her memory are her four sons, Leroy Allan Jones and his wife Linda of Marquette, Keith Emil Jones of Lincoln, Wayne Ray Jones of Aurora and Marvin Dean Jones of Lincoln; 8 grandsons; 2 granddaughters; 5 great-granddaughters; 3 great-grandsons; 5 step great-grandchildren and a step great-great grandchild. She is also survived by many nieces, nephews and other family and friends.